You can see right through this Disney Traditions Ice Bright Stitch Illuminated Statue by Jim Shore… and it lights up! 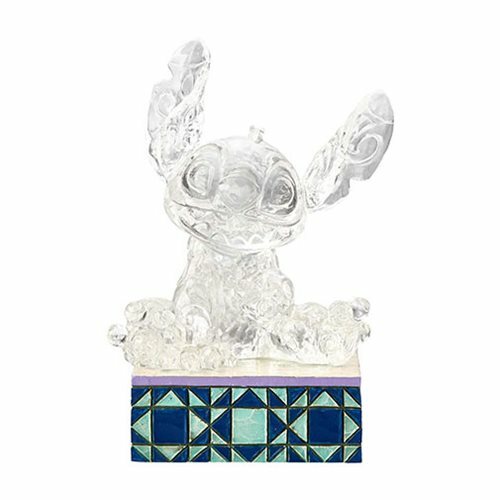 Handcrafted and hand painted to look as though it were carved from ice, this Lilo & Stitch figurine features lovable alien Stitch and his trademark grin. Colorful quilt patterns lend a whimsical finish to the platform base. This chilly design is sure to warm up those winter days! Don't worry. This crystalline design won't melt before your eyes, because it's sculpted from high-quality clear resin, polyresin, and calcium carbonate for a lifetime of love. Measuring about 4-inches tall, it requires 3x "LR44" batteries, included.